OGX believes there’s nothing to “fix” about hair. From its unique bottle shape to exotic ingredients, OGX embraces originality, encouraging consumers to “rock what you got.” This focus on authenticity and innovation has made OGX a global haircare leader. OGX wanted to raise brand awareness and increase in-store sales of its line of haircare products. It also wanted to tailor its marketing campaigns to reach a larger global audience and quickly optimise local campaigns. In early 2017, OGX reassessed its marketing strategy to focus on getting to market faster, scaling globally, and ensuring consistent messaging. Historically, campaigns had taken 6–8 months to launch, with local strategies in each market. For its spring launch, OGX planned a mobile-first approach, with newly defined global key performance indicators (KPIs) that would allow it to make quick, data-driven decisions. OGX streamlined the collaboration process by forming a small team of cross-functional stakeholders authorised to make decisions. With a “test, learn, iterate” mindset, this core team created a global learning agenda to maximise performance insights and develop best practices. OGX and its creative agency Juniper Park built a variety of creative assets to support the paid media plan and test different approaches. The team’s Q1 tests in the US and Australia proved that fewer, more consistent messages had greater business impact, which informed future campaign development. OGX centralised brand and agency resources alongside the Facebook team and worked with media agency J3 to define its media strategy across global markets. Juniper Park partnered with Facebook Creative Shop to develop a mobile-first concept, with the goal of adapting one core creative idea across global regions. The team brought video ads to life by following Instagram’s best practices for mobile (including capturing attention quickly and placing brand content at the start). 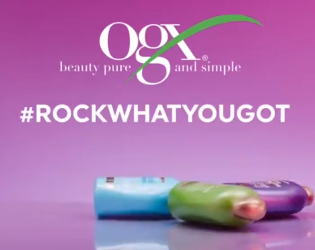 The ads featured OGX products and a variety of hair types with its “Rock What You Got” key message, and were targeted to millennial women aged 18–34. For the US ads, the team developed a broader range of OGX brand purchase segments to ensure they reached the right target audiences. Rock What You Got- Launch video from JP\TBWA \FWD Newsletter on Vimeo.